Your Dentist in Horsham Says to Floss While Flying! With the holidays among us, there will be lots of traveling. Many people will be going from state to state and country to country to see friends and family, but your dentist in Horsham doesn’t want you to put your oral health on the back burner while you’re traveling. It’s still important to brush and floss your teeth, even when you’re out of town! Dentists recommend that everyone flosses every day because flossing removes food and other lingering debris from the crevices of your smile, boosting your oral hygiene. Flossing keeps your breath fresh by removing stinky materials from your teeth, plus it wards off dental diseases. We all know it can be a tedious task, but flossing is necessary to keep your mouth properly clean and breath smelling fresh. The good news is that you don’t always have to stay perched in front of a bathroom mirror to properly clean your teeth. With advancements in dentistry, dental care practices have caught up to speed with today’s fast paced world. Now, you can floss on-the-go so you can always have a healthy smile—no excuses! 1. Bring travel floss in your car. One way to stay prepared for any food that could become stuck between your teeth is to keep an extra roll of floss in your car. It’s easy enough to look in the rear-view mirror and floss your teeth quickly while in traffic or before you run your errands. There are portable flossers that are created for a convenient handheld flossing experience. With a snippet of floss between two plastic holding pieces, you can easily floss your teeth with one hand. They’re small and easy to dispose of as well. 3. Interdental brushes clean between teeth. These brushes are tiny wires covered in bristles that you can push between your teeth to help clean in those hard to reach, tight spots in your smile. With these handy tools, you can floss your teeth on the go. What if I can’t floss? Sometimes, you may be out and about and not have a chance to floss—or the tools available. If you can’t floss a stuck piece of food in your teeth, simply try rinsing your mouth out with water or swishing it around. In the case that you can’t remove it and experience dental pain, you may need to visit your nearest dentist in case your oral health is at risk. Feel free to contact your local dentist right away! Here at Horsham Dental Elements, we want your smile to stay strong and healthy no matter what circumstances. 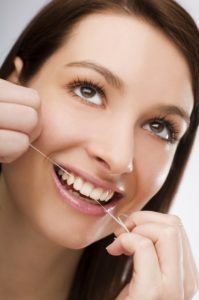 Whether you need dental services or just helpful advice about flossing techniques, you can be confident that our office will be here for you. We can be reached by phone for any questions at (215) 672-6666. Comments Off on Your Dentist in Horsham Says to Floss While Flying!